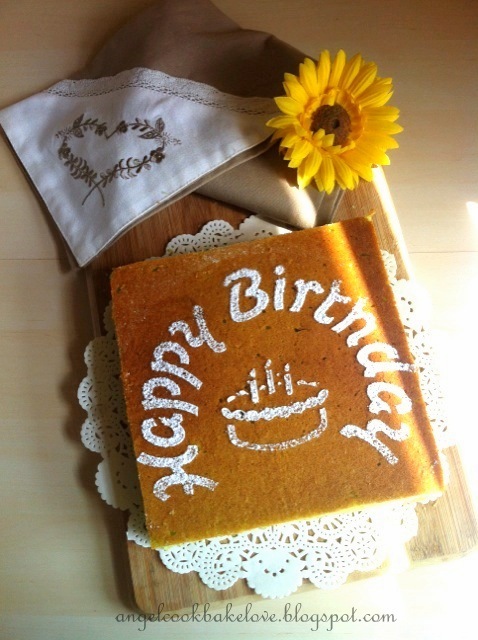 I made this cake for my mum’s birthday this year since butter cake is mum’s favorite. I didn’t plan to make it into pandan flavour, it just happened that when I opened the fridge to take butter I saw a box of opened coconut cream. The idea of using the coconut cream in the butter cake came across my mind. I added pandan paste to pair with the coconut cream. 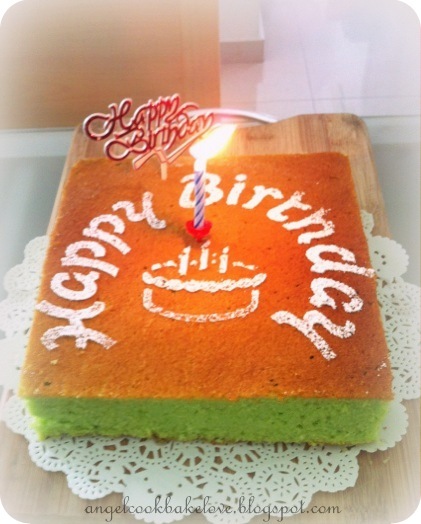 I also experimented with steam bake method for this cake. What’s the verdict? The cake turned out to be very moist and the crumbs were softer too. Cut hard butter straight from fridge into small cubes. Sieve (C) together. Line and grease a 20cm square pan or 22cm round pan. Preheat oven to 170C. Cream (A) till pale and fluffy. Add in egg one at a time, mixing well. Add pandan paste. With the lowest speed, beat (C) alternate with (D) in a few times till just combine. Scrape bowl using a rubber spatula. Pour batter into cake tin and bake in preheated oven at 170C with a cup of hot water for about 40-45 mins or until a skewer inserted and comes out clean. Due to our warm weather I do not soften the butter beforehand when I make butter cake. What I usually do is take out the butter from fridge at the beginning, cut into small cubes prior to other preparation such weighing other ingredients. By the time when all the preparation is done the butter has become soft. My family commented that the cake was a bit sweet; I will reduce the sugar to 160g next time but if omit the condensed milk I think 170g will be fine. 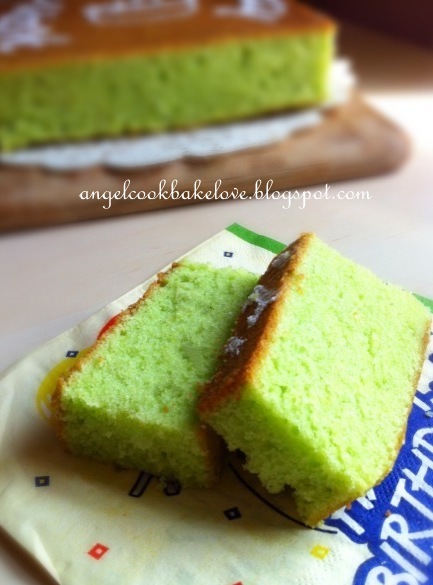 I am sure if you use natual pandan extract will be even nicer. 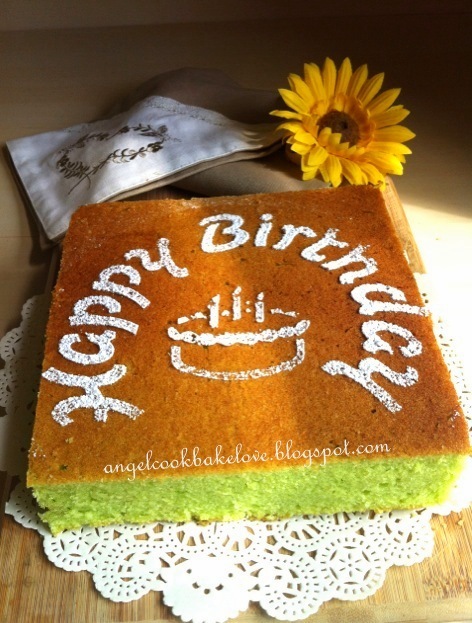 Hope you will like the cake. Happy birthday to your mum! The butter cake is beautifully done. I also try to avoid butter cake due to high fat content but it is the big hit in my family, even my husband who dislikes cake also kind of like it at least he will eat if I bake for other cake he ususally doesn't even want to taste. Looks yummy! I bet ur mum must be so happy... Belated Hqppy Birthday! Feel free to replace with fresh milk. It will tastes as good.